WE BELIEVE YOUR INVESTMENTS MUST BE ALIGNED WITH YOUR LIFE GOALS. Once we understand what's important to you, we put your money to work. Your advisor creates an investment solution that is truly personalized, with a disciplined process to select, monitor, and adjust your investments so your plan stays on track despite life's ups and downs. We believe there are more ways than one to invest to pursue your goals, and what matters is how comfortable you feel about how you are investing. When you have the right portfolio for you, sticking to your investment plan is a lot easier. 1. How much risk should I take? Every investor needs to be heard. Cautious investors may need to gently take more risk, just as aggressive investors may need to capture gains and take less risk. We work with you to find the right balance and an asset allocation that makes sense. We promise straight talk that’s focused on pursuing your financial goals. 2. What’s the right portfolio for me? 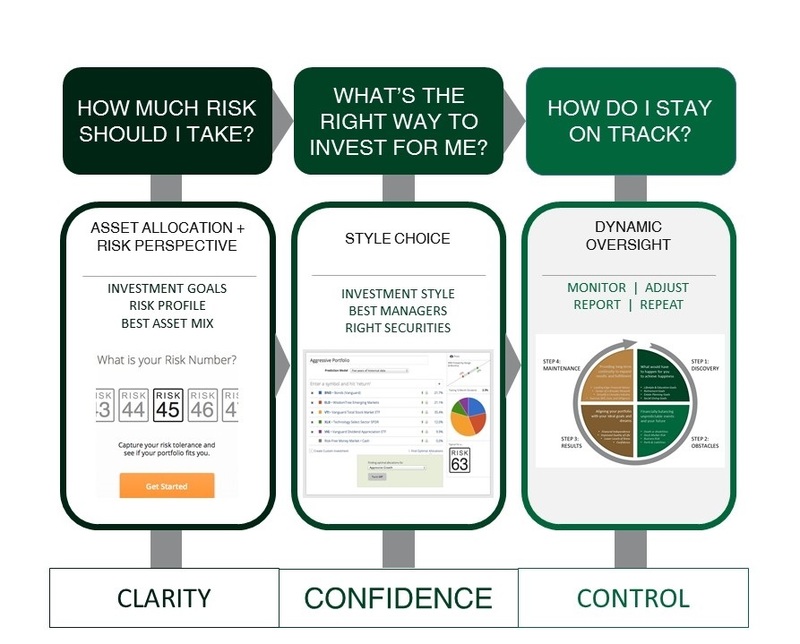 Once you have the right asset allocation, you have choices about how you can invest. How do you feel about taxes? About different geographies? How much volatility can you live with and still sleep at night? Your preferences provide direction for your adviser to select the style and type of securities you will own. There’s no cookie cutter. 3. How do I stay on track? Life and the financial markets have something in common: things change. This is where having knowledge and a disciplined process is critical. We monitor everything that can affect your investments, and we’ll make adjustments such as re-balancing or changing managers when it’s needed. We meet with you regularly, provide quarterly reports and on-line access so you’re not in the dark. It’s up to you how much you want to be engaged, but you’ll know we are on top of things. When you start working with FSA Advisors, your Investment Proposal will give you a clear picture of your investment plan. Knowing what you should own and why, and understanding how that will help you pursue your goals, you can relax. *All investing involves risk, including the possible loss of principal. There is no assurance that any investment strategy will be successful. Asset allocation is an investment strategy that will not guarantee a profit or protect you from loss.